In essence exhibits are a product of interaction design. This is what Charlotte Beall, the Deputy Director for Civic Engagement at the Bill and Melinda Gates Foundation Discovery Center, impressed upon IxDA Seattle members at an event hosted by the Discovery Center. After the audience viewed the Center’s exhibits, Beall shared the practical and aesthetic influences that shape her approach to designing immersive spaces. Beal’s design approach to creating exhibits includes a balance of techniques and mediums to provoke deep learning among visitors. She and her team prototype and iterate upon their design to hone the messaging—“What’s the main idea?”— and text hierarchy to emphasize the key takeaways. Sound familiar? Beall also takes a user experience approach to facilitate diverse audience engagement. She relies on Howard Gardner’s theory of multiple intelligences to accommodate the different ways people absorb information. Some people are social learners, others learn through ideas and concepts, some learn visually and spatially, and others are auditory or tactile learners. 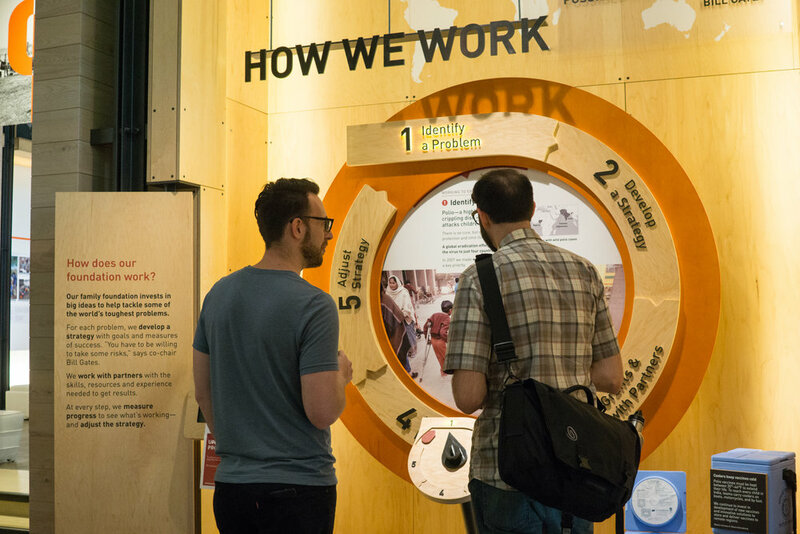 When designing exhibits, it’s important to provide a range of multi-media materials, sensations, and experiences to ensure the stories broadly resonate. Beall’s most memorable assertion was, “Content drives design, but context deepens meaning.” There is no better way to grasp context than through experience. Beall invoked the Apartheid Museum in Johannesburg as a powerful example in the way it simulates institutional segregation. Visitors are given a ticket, “white” or “non-white,” which determines their path through the exhibit. From the moment visitors walk through the separately designated doors, the exhibit is segregated to immerse visitors in the white or non-white point of view during Apartheid.